TMJ exercises give relief from jaw joint and facial pain. TMJ exercises like those for all joints and muscles will strengthen the structures and decrease pain. First, a few preliminary thoughts about the temporo mandibular joint. These exercises will undoubtedly help reduce the pain you may be having from your jaw joint but, and it’s a big one, this is a very complex structure, and it can produce a myriad of symptoms that you may not ordinarily associate with chewing, for example. So, if you are having pain that you think may be related to your temporo mandibular joint, a professional consultation is probably in order. Like the sacroiliac joints in the pelvis which also have to function in tandem, but to an even greater degree because they are much more mobile, those of the jaw have to work in harmony when chewing, speaking, kissing and swallowing; like a good marriage, they enhance each other, but a bad union causes a lot of dysfunction; enough said; you get my meaning. TMJ pain may be obvious, causing clicks and pops in the joint, difficulty opening the mouth, and pain in front of the ear. But just consider the following; the jaw joints can cause what appears to be eye and ear problems, facial pain, migraine headache, toothache, neck discomfort and many others too. This is no simple condition. The sinuses too are supplied by the trigeminal nerve and because of referred symptoms may appear to be related to other organs that at first glance are quite unrelated. Tmj exercises will help, but choosing the right ones and making the correct diagnosis, you may really find requires the work of a professional. This page was last updated on 17th November, 2018 by Dr Barrie Lewis. Temporo mandibular anatomy may help you understand your facial pain, for example. TMJ exercises may help. The TMJ is a common cause of headaches. For a delightful story free from chiropractic writer Bernard Preston, about a girl with jaw joint headaches, click here. Father Time. Here are shown some of the major structures which are often involved. Firstly the highly complex disc, and four jaw muscles, on the side of the head, the temporalis, on the side of the jaw, the masseter, both of which are jaw closers. Biters. The other two muscles lie deep in the jaw (the pterygoids). They work in harmony every time you open your mouth, to speak, yawn, chew ... they are the strongest muscles in the body, strong enough to bite your own finger off if you chose! Think tmj exercises. 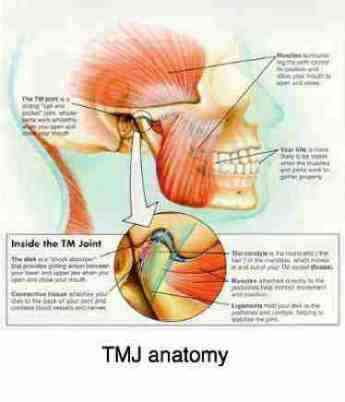 Jaw joint neurology is complex; and influenced by TMJ exercises. 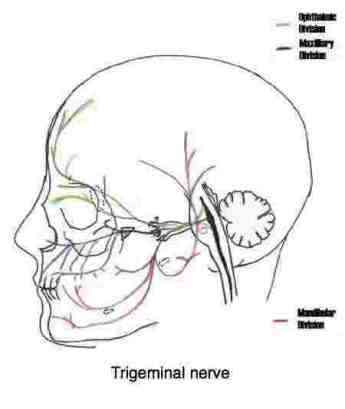 The Trigeminal nerve which supplies the jaw joint, the face, sinuses and teeth, and the upper neck, is the largest of the twelve cranial nerves. In fact it contains as much nerve material as all the other eleven cranial nerves put together. It's an important structure. What are its parts? Soon you'll see why it is so important to chiropractors. In the picture below you can see the three divisions that are sensory to the face and the deep tissues of the jaw including the teeth. It is also sensory to the jaw joint, enabling you to know whether your jaw is open or closed, and experience pain or tiredness in the jaw after chewing gum for a while. This is the nerve that lets you know how to watch out for the pip when you are biting into an olive. It is motor to the four big muscles of the jaw joint (seen above). TMJ exercises are a vital part of the correct management of the temporo mandibular joint pain if you suffer from chronic headaches and facial pain. That's part of the philosophy of chiropractic; learn to look after yourself insofar as you are able. The next picture is most interesting to chiropractors, because the sensory trigeminal nucleus reaches down into the spinal cord; it's that long thin heavy black structure in the neck, and it is also sensory to the upper 2-3 levels of the neck too. Can you see it joining with the upper neck nuclei? Ever had the odd experience that when you get sinusitis, or toothache, or jaw joint pain, you often simultaneously get upper neck pain? So, this enormously important nerve supplies the face, teeth, jaw joint and upper neck and base of the skull. That's sensory; it feels. Then it drives the muscles of the jaw on top of that. Is it any wonder that we get hopelessly confused with pain in the neck, jaw, teeth, around the face; this is a condition that really hurts. It makes people suicidal sometimes, that bad. That cauliflower structure behind is the great coordinator, called the cerebellum. It enables all these complex structures to work in harmony. I've only touched on this subject. It involves the lips, the cheeks, the neck muscles, the tongue, the swallowing muscles; really complex stuff. For example, the cerebellum is what enables you to chew without biting your tongue, lip and cheeks. The thumb is truly an amazing little limb and, like the face and the jaw joint, it receives very high representation in the brain. 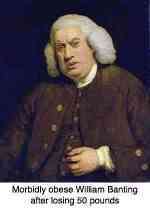 I have to say that I agree with Sir Isaac. Just believing that the thumb, or the jaw came about by freak chance, is like believing the laptop you are reading this on was the result of a freak flash of lightening, melting bits of steel and glass and moulding into your computer. Ridiculous, huh? "In the absence of any other proof, the thumb alone would convince me of God's existence." - Sir Isaac Newton known as the most influential scientist who every lived. I must stress; choosing the right TMJ exercises and doing them correctly, is paramount. Listen to your jaw. Some discomfort is to be expected in the beginning, but if your instincts tell you this is not helping, don't be silly and keep going. Seek professional help. For your first Tmj exercise sit comfortably in a high backed chair with your occiput against the head rest, and your mouth lightly closed. 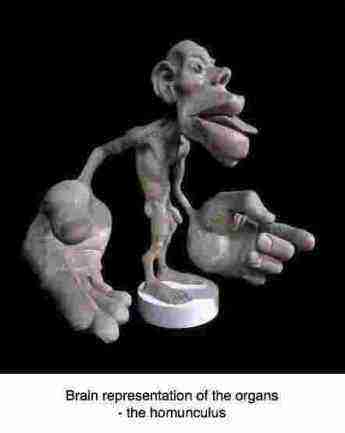 Place the web of your thumb and forefinger against the front of the lower jaw; outside of your mouth. Using your hand press on your chin, gently forcing your lower jaw backwards, and your head into the rest, neither allowing your skull or neck to flex nor extend and allowing the mouth to open slightly. Done correctly you should feel the lower teeth moving backwards in relation to the upper, as your whole mandible retracts. Relax, and allow your jaw to move forwards again, keeping your chin on the same level. Avoid looking up and down. Repeat five times, and on several occasions per day. It shouldn't be painful, and you will feel a light stretch deep in the jaw. As with any new exercise programme, do it gently to begin with. Is this new procedure helping or aggravating your TMJ and facial pain? Could it be worsening your migraine headaches? Are you getting more or less clicks and pops? Start with exercise 1, and do it for a few days. If you are feeling benefit, add 2, and then a few days later temporo mandibular joint exercise 3. One or more of these exercises may not be beneficial, remember. Do start them gently, exploring whether they are going to help or not. I get a lot of letters at chiropractic help asking for advice. Many of you have had serious jaw injuries. That might be from a punch, or a car accident, or having your forcibly opened under anaesthetic to remove wisdom teeth; whatever, these exercises should be done gently. It's quite possible they won't help, or only help partially. Done thoughtfully they're not likely to make you worse, but they could. Use your common sense. And of course do them regularly if they are proving helpful. As in exercise 1, sit comfortably in a chair, resting against the back rest. Place the web of your thumb and forefinger again against the front of the lower jaw with the teeth slightly apart. As before, using your hand press gently against our chin to force your lower jaw gently backwards. Done correctly you should feel the lower teeth moving backwards in relation to the upper teeth, just as in exercise 1. Don't open your mouth any extra. You will feel a stretch deep with the jaw joint. Don't go too deep initially; the intention is essenially to stretch the muscles rather than the capsule of the jaw joint. Now gently push your lower jaw, not your whole head, forwards against your hand. Hold fast for a few seconds. Then, relaxing your hand, use your jaw muscles to gently push your lower jaw forwards, so that the lower teeth protrude. Hold for a second or two. Repeat by gently pushing the jaw backwards again with your hand. Do this maybe three or four times, several times a day. If your muscls ache during or after this period, use a little cream to massage the temporalis and masseter muscles before you start exercise 2. You may also use alternating ice and heat if you have pain in the jaws after these exercises. For the third of our TMJ exercises - with your teeth closed gently against each other - rest the tip of your tongue against the top of your mouth, just behind the front teeth. Now run the tip of your tongue backwards along the top of your mouth, keeping the teeth closed, until you can just reach some soft tissue (the soft palate). Lastly, and this is where you must be careful, slowly open your mouth, trying to keep the tongue against the soft palate. When you feel your tongue being pulled away from the soft palate, STOP. Don’t open any further. In fact, to start with, stop before your tongue leaves the soft palate, or if it hurts, or you get clicks or pops. NB. Stop opening your mouth before the jaw pops if you have a popping jaw. Hold this position for a few seconds and then relax. Repeat only once or twice to begin with. GENTLY DOES IT, YOU'RE NOT GOING TO THE TMJ OLYMPICS! Your muscles will tire and feel sore quite quickly. Chewing gum - TMJ exercise 4? It remains controversial, but there has been research suggesting that chewing gum improves short-term memory. However, research done at Cardiff University (Science Direct 48(2007) with sugarless, flavourless gum contradicts the earlier research. In fact short-term memory was worsened. "Abstract: The experiment examined the prediction that chewing gum at learning and/or recall facilitated subsequent word recall. Chewing gum at learning signiﬁcantly impaired recall, indicating that the chewing of gum has a detrimental impact upon initial word encoding. The ﬁndings contradict previous research." They reason that any improvement in memory is linked to the flavouring in the gum - which last a maximum of four minutes. I have no research to confirm it, it's just an opinion, but I am under the impression that gum overloads the jaw joints, certainly in people with TMJ dysfunction. Chewing gum should not in my opinion be consided good TMJ exercise. For TMJ exercise 5 consider the apple diet; research shows that munching on a few slices BEFORE breakfast has an amazing effect on many serious allergies; but do cut it up into manageable sizes. Migraine headaches and facial pain often come from the jaw joint and may have nothing to do with smelly cheese or chocolate; as with all musculoskeletal conditions, TMJ exercises are a good place to start before expensive invasive treatment. TMJ exercises are part of the solution. Repeat with the masseter muscle. It is located on the side of your jaw. Placing your thumb inside the mouth, and gently squeezing the nodules may be helpful. To reach the pterygoid muscle is more difficult. Slide the tip of your index finger, pad facing outwards, between the upper teeth and the cheek, as far back as you can. You will reach a little crevice called the pterygoid pocket. Gently massage the muscle, pressing outwards, slowly moving the jaw. It is often exquisitely tender with TMJ problems and migraine headache. Mrs van den Hoek is a youngish woman, mid thirties. She consulted me on the recommendation of a friend. Body language told much of the story, this woman was in severe pain. She had had blinding headaches and severe pain on the side of her face for some six months. A neurologist diagnosed Trigeminal Neuralgia, one of the most painful conditions known to man, and she had to learn to live with the pain. Other than killing the nerve, there is no known treatment. Patients have been known to commit suicide. She had a relatively simple Temporo-mandibular joint condition. The opposite joint was fixated, and the lateral pterygoid muscle, deep in the pteryoid pocket was red hot. We used to think it a coincidence that neck and jaw pain so often appear together, but now you understand the strong neurological link between the upper neck and the TMJ: she also had a severe subluxation of the axis bone in her neck. Chicken and egg. Note: Not all chiropractors are trained in the treatment of the Tempero-mandibular joint. Phone your state association. She had an extreme reaction to the first treatment, as I warned her, but within a 10 days was 50% better. It's now six weeks since her first consultation (8 treatments) and she has no facial pain any longer, though she is still having occasional headaches. We are into the rehabilitation phase of the care (I wrote this page so she could do the TMJ exercises correct) and she is a different person. 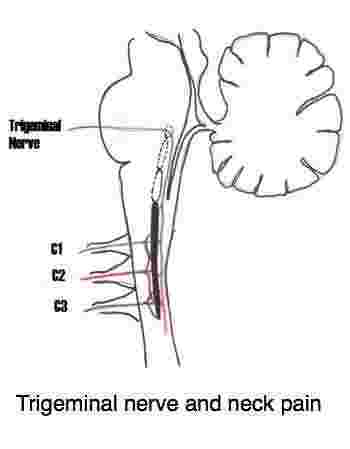 TMJ pain can be very severe. Hot Tip: Avoid biting hard things, like into a whole apple with your front teeth. Rather cut it smaller so that you don't have to open your mouth so wide. Whilst doing your TMJ exercises consider a couple of stiff neck exercises, whether or not your neck is stiff. The neck and the TMJ are intimately connected. Do you have a question about your jaw joint? Shoot! The jaw joint is a major cause of severe facial pain and migraine headache and is often involved in trigeminal neuralgia. Pretty please: don't write from your smartphone, and in decent English. Many people will be reading your question, and it downgrades the site if you write gobble-di-gook. Enter Your Title. Keep it short. Tip. Since most people scan web pages, just as you're doing right now, include your best thoughts in your first paragraph. Head & jaw motions spiking a sciatica? Can a TMJ syndrome affect hearing?